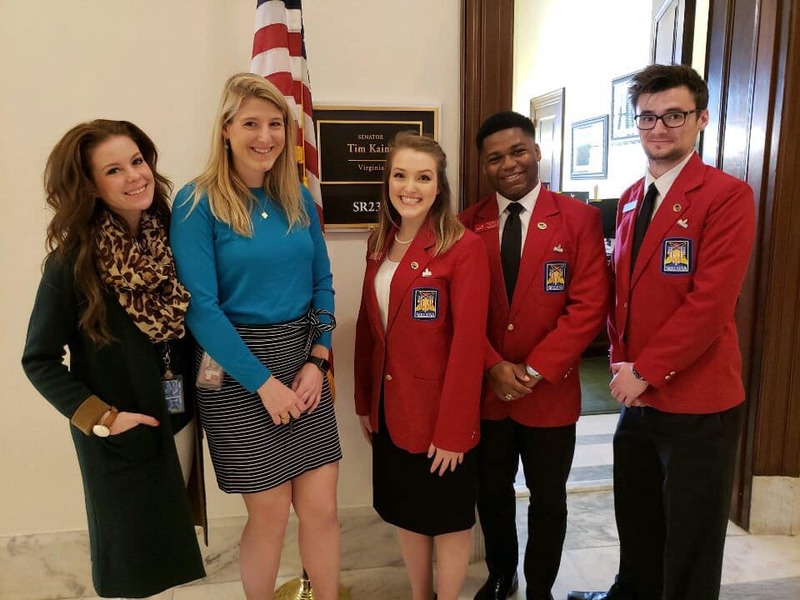 SkillsUSA students serving as national officers visited Washington, D.C., Feb. 5 to advocate for SkillsUSA and career and technical education (CTE) during SkillsUSA Week and CTE Month. 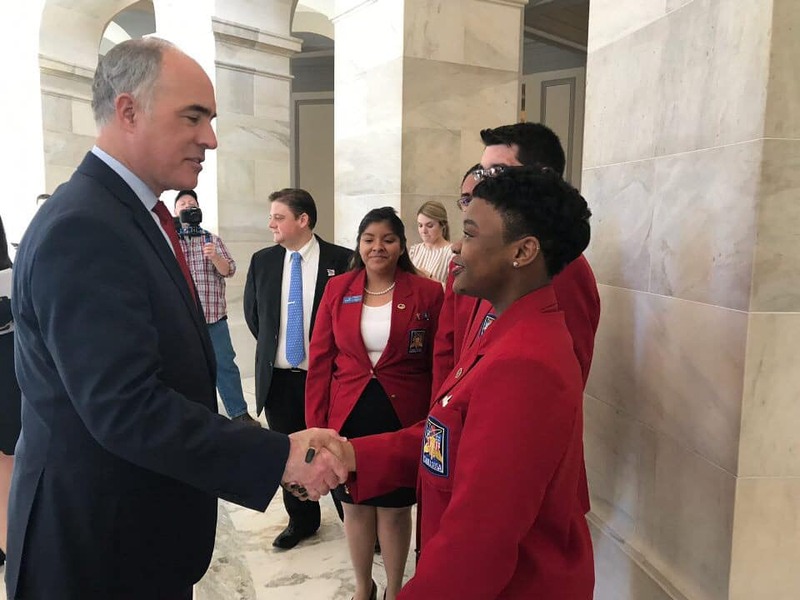 Starting the day at the U.S. Department of Education’s Office of Career, Technical and Adult Education (OCTAE), 13 members of the SkillsUSA national officer team, along with executive director Tim Lawrence and other staff, were greeted by Assistant Secretary of Education Scott Stump. The OCTAE meeting was chaired by Casey Sacks, deputy assistant secretary for community colleges. Attending were Department of Education staff including Sharon Miller, Steve Brown, Craig Stanton, Richard Petty, Jim Williams and Mike Chamberlain. Also involved in the meeting were Channellock Inc. representatives including vice president Ryan DeArment, Ashley Dillon and Maryclaire Gilbert. 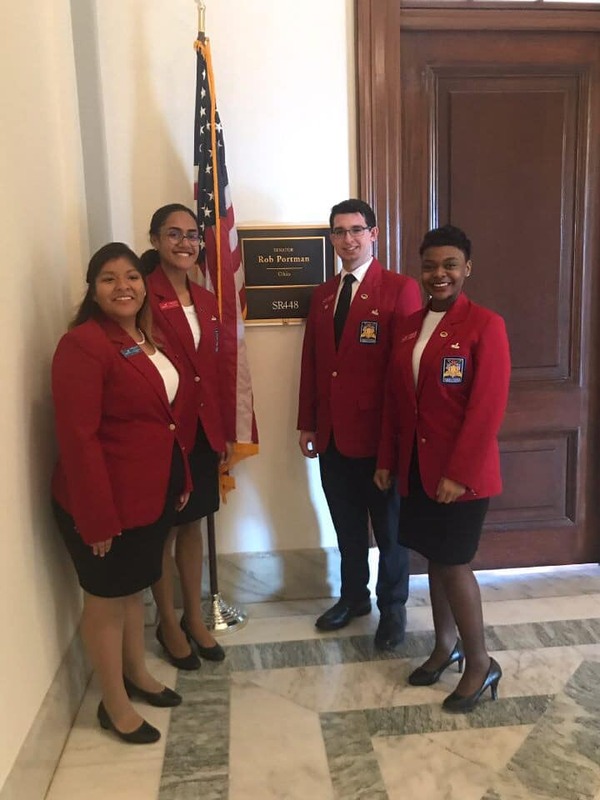 The group talked about the SkillsUSA Framework, credentialing through the SkillsUSA Career Essentials suite, and SkillsUSA as a skills gap solution. There was an update from OCTAE on Perkins V legislation funding CTE. Next, the group met with Laurie Rowe, senior policy advisor to Secretary Alexander Acosta, at the U.S. Department of Labor. The group discussed credentialing through the SkillsUSA Career Essentials suite, apprenticeship and other opportunities for CTE students. 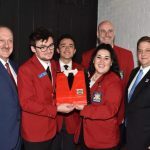 At the meeting were Lawrence, SkillsUSA chief partnerships and development officer Amy Serafino, several SkillsUSA national officers and the Channellock Inc. representatives. 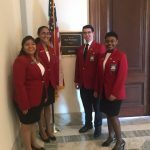 Students then headed to Capitol Hill to visit Kerry McKittrick at the office of Rep. Jim Langevin (R.I.); Sam Hattrup at the office of Rep. 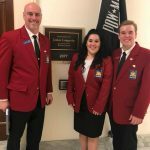 Rob Portman (Ohio); Nick Rockwell at the office of Rep. Glenn Thompson (Pa.); and Sasha Rauch-Kelly at the office of Sen. Tim Kaine (Va.). 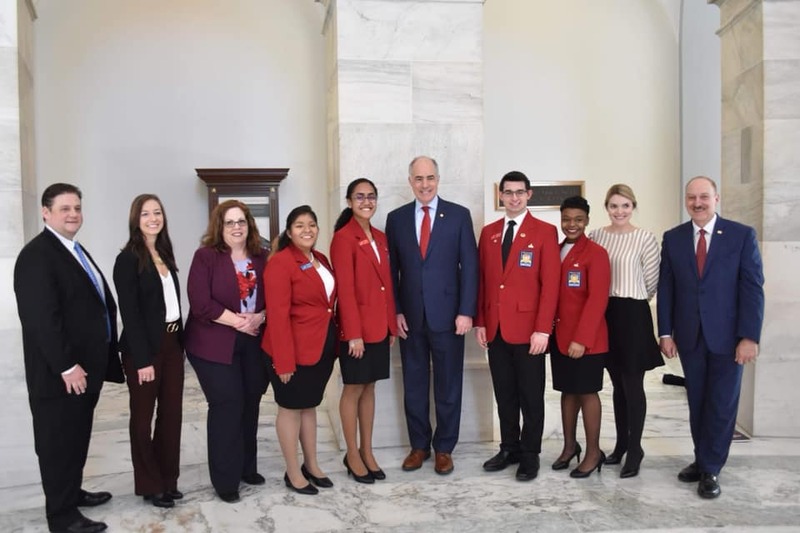 The last legislative appointment of the day was with Senator Bob Casey Jr. (Pa.), where the group had a photo opportunity and short visit. 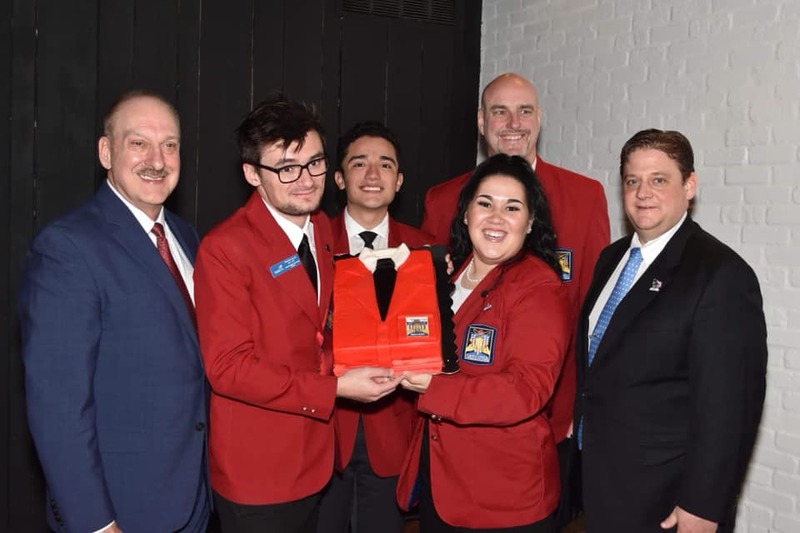 The day ended with the group celebrating over lunch and a cake fashioned in the shape of a red SkillsUSA blazer with a black tie and white shirt. Other activities coordinated by the national headquarters for SkillsUSA Week included a Feb. 4 assembly and campus tour at Nash Community College in Rocky Mount, N.C., with SkillsUSA North Carolina director Peyton Holland and representatives of Channellock; a Feb. 7 school assembly and tour of Crawford County Career and Technical Center in Meadville, Pa., with SkillsUSA national officers and representatives of Channellock; and a Feb. 8 visit by national officers and Channellock representatives to Catawba Valley Community College in Conover, N.C., to tour the 80,000-square-foot Workforce Solutions Complex. 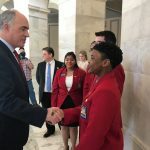 At each visit, the focus was to discuss opportunities in the skilled trades and the importance of service to others, a key component of all SkillsUSA chapters’ program of work. “What a great week,” said Lawrence. 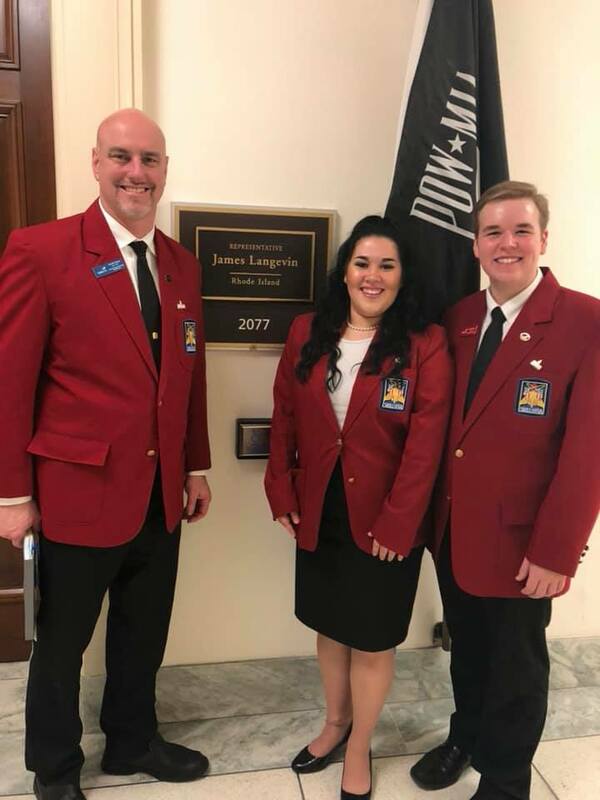 “SkillsUSA Week is a time to lift up our students, chapters, teachers and recognize business partners such as Channellock and Toyota, who bolster support for local programs. SkillsUSA is a talent pipeline that graduates 100,000 SkillsUSA students each year. This is one of our most important weeks of the year.” Channellock, Inc. was lead sponsor of SkillsUSA Week. SkillsUSA longtime partner Toyota also sponsored the week of festivities. 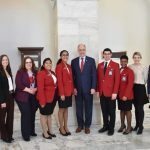 For a list of SkillsUSA schools who each received up to $1,000 to host an open house during SkillsUSA Week (Feb. 3-9) as a way of increasing community awareness and recruiting members, go to: www.skillsusa.org/events-training/skillsusa-week.